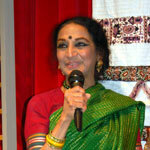 Menaka Thakkar is a master dancer in three classical Indian styles - Bharatanatyam, Odissi and Kuchipudi. Now in her 65th year, Ms. Thakkar settled in Canada over 37 years ago at the peak of her career as an international soloist. She is credited (along with Kathak dancer Rina Singha) as having been the first artist to introduce Indian culture to Canadian audiences. In the early years Ms. Thakkar performed across Canada and soon began to train youngsters in classical bharatanatyam. Eventually she began creating original choreographies that were performed in major venues across Canada. She opened the first school of Indian dance in Canada, Nrytakala, which continues to train new generations of dancers and formed the Menaka Thakkar Dance Company comprised of graduates of her school. The Menaka Thakkar Dance Company became the first South Asian arts organization to be recognized by the Canada Council for the Arts, thereby opening the door to other multicultural artists to receive funding. Today, the Menaka Thakkar Dance Company, known as MTDC, is Canada's premiere Indian dance company. It includes up to 20 professional dancers who have each studied with Ms. Thakkar from 16 to 26 years. Ms. Thakkar has won many awards and honours in her long career including an honourary doctorate from York University, 2006 City of Toronto Face the Arts Cultural Maverick Award for Dance, Toronto Arts Award for Performing Arts, President's Award from Indo-Canada Chamber of Commerce and Tri-National Creative Residency Award from the Canada-Mexico joint program administered by the National Endowment for the Arts, United States. Ms. Thakkar has created groundbreaking choreographies since coming to Canada which reflect both her exposure to western dance styles and her background in classical Indian dance. She has collaborated with many of Canada's most accomplished dancers including Claudia Moore, Danny Grossman, William Lau, Robert Desrosiers, Patrick Parson, Debbie Wilson and Grant Strate to create possibly some of the first fusion pieces in Canada and group choreographies for Indian dancers. In addition, Ms. Thakkar has also reached out to students of ballet at the National Ballet School through an annual residency in which she has trained ballet students in classical bharatnatyam for the past 20 years. Today, the legacy continues with the formation of the new wing of MTDC for contemporary Indian dance, which nurtures young professionals in creating choreography and provides opportunities to work with company dancers. Ms. Thakkar's school, Nrytakala, located in Thornhill, Ontario, annually trains over 100 students from ages five to 18 and has graduated close to 150 students in their junior and senior arangetrams. Many of the graduates have gone on to develop their own dance companies and solo careers in dance such as Winnipeg's Manohar Dance Company, Natasha Bakht, Niharika Mohanty, and Nova Bhattacharya. MTDC has recently developed a new wing for young audiences and performs shows in theatres and schools in Ontario and British Columbia annually. The Menaka Thakkar Dance Company continues to present an annual home season in Toronto and tours nationally every year. The MTDC dancers are rigorously trained and continuously provided with professional development training in body conditioning and with special choreo-labs in other kinds of dance styles to increase their versatility as dancers. Menaka Thakkar continues to oversee the company and school's operations as the Artistic Director and continues to develop uncompromising choreographies which consistently break new ground and change the face of Indian dance in Canada.